This article is about the town in England. For other uses, see Bungay (disambiguation). Bungay /ˈbʌŋɡi/ is a market town, civil parish and electoral ward in the English county of Suffolk. It lies in the Waveney valley, 5.5 miles (9 km) west of Beccles on the edge of The Broads, and at the neck of a meander of the River Waveney. 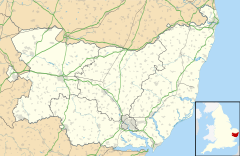 The origin of the name of Bungay is thought to derive from the Anglo-Saxon title Bunincga-haye, signifying the land belonging to the tribe of Bonna, a Saxon chieftain. Due to its high position, protected by the River Waveney and marshes, the site was in a good defensive position and attracted settlers from early times. Roman artefacts have been found in the region. Bungay Castle was built by the Normans but was later rebuilt by Roger Bigod, 5th Earl of Norfolk and his family, who also owned Framlingham Castle. Bungay's village sign shows the castle. The Church of St. Mary was once the church of the Benedictine Bungay Priory, founded by Gundreda, wife of Roger de Glanville. The 13th-century Franciscan friar Thomas Bungay later enjoyed a popular reputation as a magician, appearing as Roger Bacon's sidekick in Robert Greene's Elizabethan comedy Frier Bacon and Frier Bongay. The town was almost destroyed by a great fire in 1688. The central Buttercross was constructed in 1689 and was the place where local farmers displayed their butter and other farm produce for sale. Until 1810, there was also a Corn Cross, but this was taken down and replaced by a pump. Bungay was important for the printing and paper manufacture industries. Joseph Hooper, a wealthy Harvard graduate who fled Massachusetts when his lands were seized after the American Revolution, rented a mill at Bungay in 1783 and converted it to paper manufacture. Charles Brightly established a printing and stereotype foundry in 1795. Then in partnership with John Filby Childs, the business became Brightly & Childs in 1808 and later Messrs. Childs and Son. Charles Childs (1807–1876) succeeded his father as the head of the firm of John Childs & Son. The business was further expanded after 1876 as R. Clay and Sons, Ltd. The railway arrived with the Harleston to Bungay section of the Waveney Valley Line opening in November 1860 and the Bungay to Beccles section in March 1863. Bungay had its own railway station near Clay's Printers. The station closed to passengers in 1953 and freight in 1964. Local firms include Clays Printers, owned by G Coleman and St. Peter's Brewery, based at St. Peter's Hall to the south of the town. In 2008 Bungay became Suffolk's first Transition Town and part of a global network of communities that have started projects in the areas of food, transport, energy, education, housing, and waste as small-scale local responses to the global challenges of climate change, economic hardship and limited of cheap energy. St Mary's Church was struck by lightning on Sunday, 4 August 1577. During the thunderstorm an apparition appeared, consisting of a black Hell Hound which dashed around the church, attacking members of the congregation. It then suddenly disappeared and re-appeared in Holy Trinity Church, Blythburgh 12 miles (19 km) away, injuring members of the congregation there. The dog has been associated with Black Shuck, a dog haunting the coasts of Norfolk, Essex, and Suffolk. An image of the Black Dog has been incorporated in the coat of arms of Bungay and has been used in the titles of various enterprises associated with Bungay as well as several of the town's sporting events. An annual race, The Black Dog Marathon, begins in Bungay, and follows the course of the River Waveney and the town's football club is nicknamed the "Black Dogs". Black Shuck was also the subject of a song by The Darkness. The local football club, Bungay Town F.C. play in the Anglian Combination, having previously been members of the Eastern Counties League. Godric Cycling Club is based in Bungay. It organises a number of events each year, including weekly club runs. Bungay was home to several literary figures. Thomas Miller (1731–1804), the bookseller and antiquarian, settled in the village. His publisher son, William Miller (1769–1844), was born there. The author Elizabeth Bonhôte née Mapes,(1744–1818) was born and grew up there, marrying Daniel Bonhôte and writing the notable book Bungay Castle, a gothic romance. Bonhôte even once owned Bungay Castle. The Strickland family, which according to the Canadian Dictionary of Biography was as prolific as the Brontës, Edgeworths, and Trollopes, settled in the village 1802–08. Its daughters included Agnes, a historian. Others were Catharine Parr Traill, who concentrated on children's literature, and Susanna Moodie, who emigrated to Canada and wrote Roughing it in the Bush (1852) as a warning to others. The novelist Sir H. Rider Haggard (1856–1925) was born nearby in Bradenham, and presented St. Mary's Church with a wooden panel, displayed behind the altar. Religious writer Margaret Barber (1869–1901), author of the posthumously published best-selling book of meditations, The Roadmender, settled in Bungay. More recently, Formula 1 motor racing president Bernie Ecclestone was brought up in Bungay and internet activist Julian Assange was confined to nearby Ellingham Hall, Norfolk in 2010–11. Authors Elizabeth Jane Howard and Louis de Bernières have lived in the town. Blind artist Sargy Mann moved to Bungay in 1990, and lived there until the end of his life. Children's author and illustrator James Mayhew currently lives in Bungay . ^ "Ward and Town population 2011". Retrieved 19 September 2015. ^ G. M. Miller, BBC Pronouncing Dictionary of British Names (Oxford UP, 1971), p. 22. ^ Page, W. (1975), 'Houses of Benedictine nuns: Priory of Bungay', A History of the County of Suffolk: Volume 2, pp. 81–83 (available online). Retrieved 30 April 2011. ^ Shipton, Clifford K (1970). Sibley's Harvard Graduates; Biographical Sketches of Those Who Attended Harvard College. Cambridge, MA: Harvard University Press. pp. 404–406. ^ White, William (1844). History, Gazetteer, and Directory, of Suffolk. Sheffield, England: R. Leader. p. 425. ^ "Childs, John" . Dictionary of National Biography. London: Smith, Elder & Co. 1885–1900. ^ Malster, Robert (2005). "Bungay 1926". Old Ordnance Survey Maps. Alan Godfrey Maps. ^ Waveney Rural Community Partnership – Sports Information Archived 1 September 2009 at the Wayback Machine. Retrieved 10 May 2010. Wikisource has the text of the 1911 Encyclopædia Britannica article Bungay. Wikimedia Commons has media related to Bungay. Wikivoyage has a travel guide for Bungay. Look up Bungay in Wiktionary, the free dictionary.